What’s in that ice cream you’re eating? Or the cheese that’s on your sandwich? In fact, what’s in your milk? Ironically it’s not just milk, and that may surprise you. All over the country, we’re being exposed to recombinant bovine growth hormone (rBGH), an artificial growth hormone given to dairy cows to stimulate milk production. All this exposure despite the fact that rBGH has been linked to increased risk of breast cancer. rBGH also increases the development of mastitis in dairy cows which in turn leads to an increased use of antibiotics which also end up in our milk supply! My biggest beef about all of this (no pun intended)? You won’t find this information on the label of a single dairy product using milk treated with rBGH. We need to get this junk out of our food supply once and for all. rBGH is banned in the European Union, corporate giants like Starbucks refuse to use it, and Wal-Mart won’t put their brand label on dairy products sourced from rBGH cows. Those in favor of keeping rBGH in in our food chain claim it’s not harmful. Yet the science proves that we have reasons for concern. rBGH increases the production of insulin-like growth factor-1 (IGF-1) which circulates in cows’ blood and then enters their milk. Research shows that when it’s present in the human body at elevated levels, IGF-1 increases the risk of breast, colon, prostate and other cancers. In fact, one study indicates that women with the highest fifth of IGF-1 levels have a 28% higher risk of breast cancer than women in the lowest fifth. There are numerous ways we could address this problem. We’ve tried the individual manufacturer-by-manufacturer approach (see our successful “Yoplait: Put a Lid on It” campaign). But approaching companies one by one takes a lot of time, and meanwhile millions of people are still being exposed to rBGH. It’s time we go straight to the source of the hormone itself. Eli Lilly is the only company in the world that makes and distributes rBGH (under the drug name Posilac). Our efforts to get rBGH out of the food supply have to focus on them. We must protect everyone’s health, especially vulnerable groups like low-income communities who may not have the choice of whether to buy rBGH-free dairy products and children and pregnant women whose bodies are more susceptible to harmful environmental toxins. And the more you know about Eli Lilly, the uglier it gets. Eli Lilly makes a lot of money from breast cancer all in the name of improving women’s health outcomes. At Breast Cancer Action we call that pinkwashing! In fact, Eli Lilly has a highly lucrative profit cycle in place that is going to keep making them money as long as breast cancer is around. They manufacture rBGH, which has been linked to an increased risk of breast cancer, they manufacture Evista to “prevent” breast cancer, and they produce Gemzar to treat the disease. Really? And they proudly assert their core values of “integrity, excellence, and respect for people.” How does manufacturing a growth hormone that may increase a woman’s risk of developing breast cancer demonstrate “integrity”? How does it show “excellence”? How is it a declaration of “respect for people”? Taking all necessary action to ensure that the products they make do not put people at increased risk for breast cancer. Follow the precautionary principle and stop making rBGH and any other products that are suspected of harming human health. Never engaging in pinkwashing by producing, selling, or endorsing products in the name of breast cancer that themselves are linked to the disease and put women at increased risk for developing breast cancer. 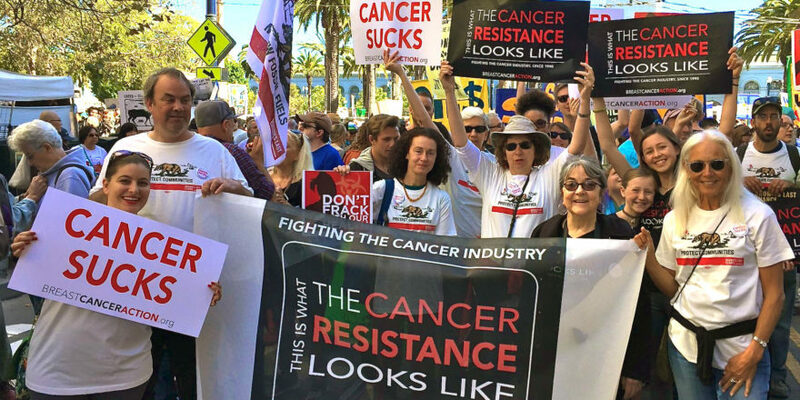 Help build on the momentum activists have been creating for years through direct corporate campaigning, national education efforts, media attention, and a Milking Cancer video (which was recently featured in the film Pink Ribbons, Inc.). Demand that Eli Lilly stop making rBGH and sign BCAction’s Pledge to Prevent Pinkwashing. Editor’s Note: A previous version of this post erroneously stated a link between rBGH and obesity and diabetes. We apologize for the error.